We were thankful to find that the park trails were still open. 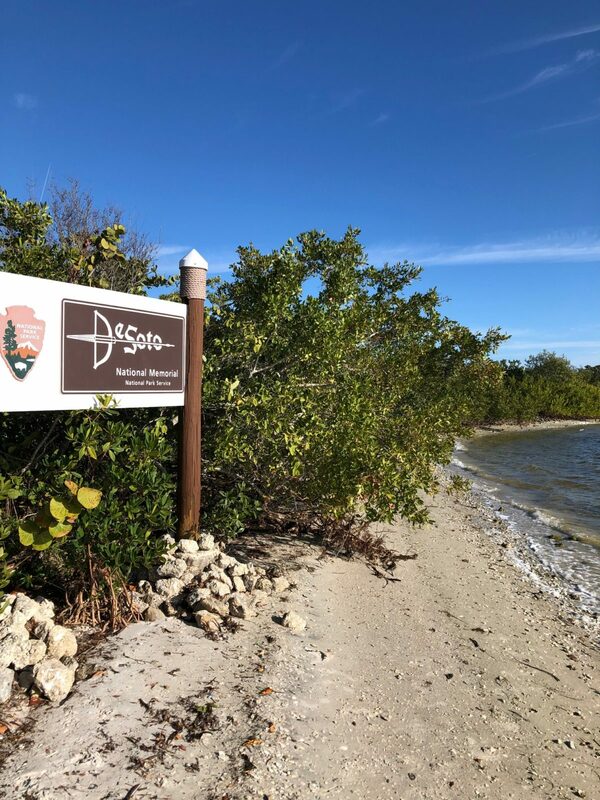 We had planned our trip over 6 months ago and had flown into Tampa on purpose so that we could visit De Soto National Memorial. It would have been a shame to have had to miss it. 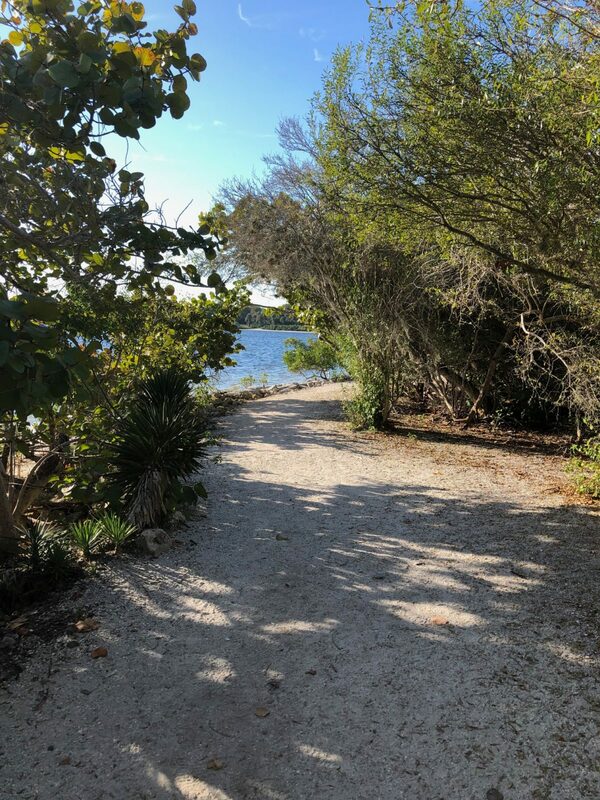 It was a lovely park – 48 acres right on the Manatee River. You could picture what a great landing spot this was for De Soto and his ships in 1539. With the park not open, we had done lots of research on our own prior to coming; learning as much as we could about De Soto and the Spanish Conquistadores. Of course there is lots of good information available on the web, but as we walked through the park and read the various interpretive signs, it really helped give us context for what we had read. 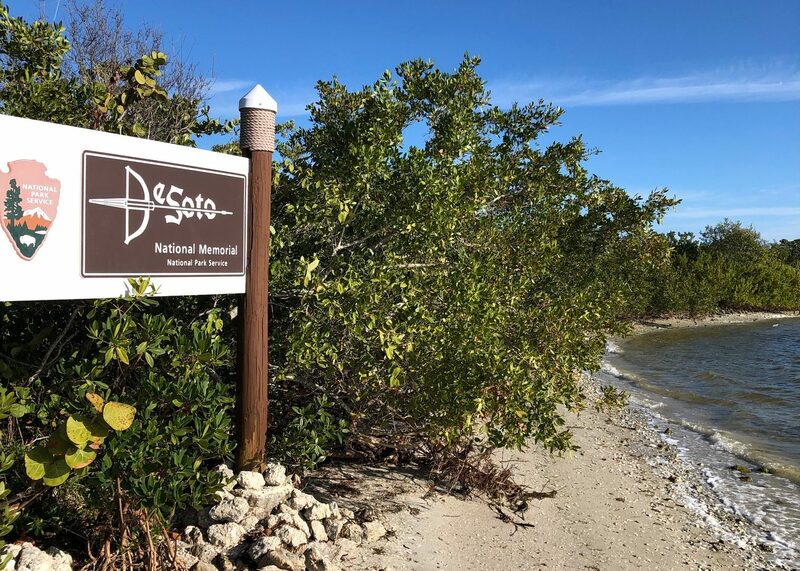 We had not realized it, but even though the memorial is in Florida, De Soto had actually traveled over 4000 miles to search for riches. In fact, he was one of the first Europeans to cross the Mississippi River! He was brutal … even though he paid for missionaries to come to convert the heathens, he was more prone to plunder and murder. There was even one sign telling of him setting the hounds on an Indian guide. These sure weren’t pets. They ripped people to shreds and ate them. I guess that’s why they were called Blood Hounds. As you walk along the short trail through the park, there are lots of interpretive signs. They point out the landing site and talk about the native Indians, De Soto and his men. They landed there with just a couple hundred horses and less than 800 men, plus packs of Bloodhounds and Irish Greyhounds and a herd of pigs, and arms and equipment. Imagine traveling across the ocean with a herd of pigs! When they landed, they established a base camp at that spot where they could protect their supplies. No consideration that the point they landed actually was an Indian village. There was a small replica of Camp Uzita and an Indian hut, plus an ancient dugout canoe. Usually there are living history enactments there, but for our visit, all was quiet. The park was not quiet however. There were lots of local residents out on the trails walking their dogs or taking their children to the beach. It was lovely to see them enjoying their national park and the adjacent preserve. We were also delighted to see volunteers out there, keeping things clean and safe. We thank them and appreciate that others share our love for the national park system.